Buckle up travel bugs, breathtaking locations await at the Philippine Airlines Year End Sale 2018! With next year’s travel season just around the corner, it pays to plan your dream getaway in advance. If you are too busy this year to take a trip, then this is the perfect opportunity to settle on some dates and plan the adventure of a lifetime without pinching pennies. 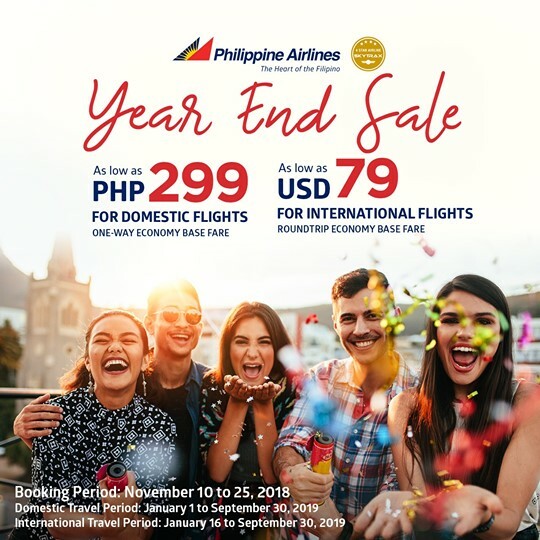 Don’t miss Philippine Airlines Year End Sale 2018 and give in to your wanderlust. Book now until November 25, 2018 and enjoy jaw-dropping deals for as low as Php299 on local destinations and $77USD on international locations. PAL Sale tickets are not applicable during blackout dates. The fares quoted are exclusive of government taxes, fees, ticketing service charge and surcharges. Taxes and charges are subject to change with or without prior notice by the authority. No Show fee for US/CA/LON is USD125 and USD75 for all other sectors. Fare is inclusive of 7kg handcarried baggage. Free baggage allowance will vary per route.